The “Black Hole” of Balaklava… Special correspondent of the Vokrug Sveta (Around the World) magazine visited the only secret subterranean harbor in the world, the site where Soviet submarines were concealed. Around the mouth so the passage in is cramped. Anyone who has ever entered or left here by sea will confirm: “Yes, it’s Balaklava.” It is precisely that - divided by cliffs to form two shores of a single harbor. All the streets of Balaklava descend steeply to the seafront. The orphaned-looking gray slate roofs are sparsely sprinkled by red tile roofing. One thirstily searches for these scraps of that prewar, pre-revolution, antediluvian Balaklava, the Balaklava of Kuprin and Grin. Alas, the war swept the ceramic tiles, the "Marseilles,” off the houses, and the palette of the city lost its main color. Balaklava also lost much of what made up the loveliness and charm of this unique seaside town due to its recent half a century status of a "closed town." Where are they, the small, cozy coffee houses and taverns the main seafront embankment almost entirely consisted of? No, not the public catering cafes with instant coffee, but those Greek coffee houses, where real ground mocha is boiled in copper coffee pots buried in red-hot sand, and stirred with sticks made of camphor tree or arborescent juniper. Neither did the disappeared taverns have anything in common with the “cafeteria-eateries” of today. Somewhere around here, if Grin is to be believed, should also be the “Zaverni k nam” (“Stop by us") tavern? No, it’s not there either. And the smell of this melted-away world - the aroma of fried flatfish, the coffee, boiled over into the hot sand, the baked eggplant – is also gone... It’s true that the modern restorers try to imitate the old Balaklava; they even came up with a “Black Prince” cake, hung hemp ropes everywhere, and replaced tables with oak barrels. But no decoration will ever revive the spirit of the lost times. …Finding myself nowadays in London, the first thing I noticed was a monument in memory of the Crimean War. The words cut out in the cast iron plaque said “BALAKLAVA. 1854.” That year, English troops approached Balaklava and were met by concerted fire of the local Greek battalion and the artillery mortar battery of Lieutenant Markov. Fighters settled in the ruins of an ancient Genoese fortress, whose eroded and riddled towers still reign over the city today. The twenty-ship squadron was forced to open frenzied fire before the four copper one-and-half pood mortars were silenced. The British task force chose Balaklava to be its main resting base in the Crimea. The English settled down here for a long time to come, and with all their pleasure. Engineers built a comfortable embankment (still the main promenade of the town), shops, pubs, hotels, and recreation centers. This was when they began calling the ancient Omen Harbor, the “Small London.” However, this harbor held no good promises for the newcomers. In three years time, they were forced to clear off, leaving behind them the embankment with gun barrels embedded in place of mooring dolphins (the Balaklava fishermen still use them to tie their motorboats), a few good roads paved towards Sevastopol, and a military cemetery, the burial place of a relative of William Churchill, Duke Marlboro’s family representative, who died in the Battle of Balaklava. The cemetery was damaged in the past war and was taken down during the Khrushchev years. Forgive the odd play on words, but the English cemetery was resurrected during the perestroika, when a Sevastopol entrepreneur/patriot Valery Ivanov restored the stone fence with embedded cast iron slabs. They display the names of royal regiments, brigades, and ships that suffered considerable losses in the battles for Sevastopol and Balaklava. In the fall of 1995, Prince Charles paid a visit to the restored military memorial. He was hardly delighted to learn about a pagan temple in honor of the goddess Diana, located in the vicinity of Balaklava, and the remains of the English steamship Prince on the sea floor by the Cape Aya. The family ship of the Prince of Wells was quickly sinking into the depths of the "sea of everyday life,” and all these attractions were only bringing up gloomy associations. Incidentally, one of the relatives of Princess Diana is also buried in the Crimean soil. He died in the battle on the Alma River. It’s in his memory that the French named that same, fatal for Lady Di, bridge, where, in its tunnel, death awaited her. Everything got mixed up in this most mystical corner of Tavria. But the intricacies of the historical mosaics contain their own unchangeable constants. One of them is the heroic fact that during the Great Patriotic War, Balaklava was the outermost point of the left flank of the huge frontline that encircled the country from sea to sea. Once again, the ancient Genoese towers met the uninvited strangers with fire. The governor of the “Genoese fortress” was Sub-Lieutenant Grigory Orlov. His machine gunners repelled the assault company attacks for several months. Gregory Orlov, a full namesake of the Count-paramour of Catherine the Great and the former participant of the Moscow’s Metrostroy, joined the military history of Balaklava together with Lieutenant Markov. Balaklava… Quite recently, about five years ago, this is how it looked: masts and antenna grids, locator dishes and wave conductor rods, firing radars that look like tightly welded tanks, periscopes and signal bridges, protruded from the white stone wall of the Morzavod. This entire collection of naval iron was reminiscent of the chimerical Island of the Lost Ships. And that’s close to what it actually was. 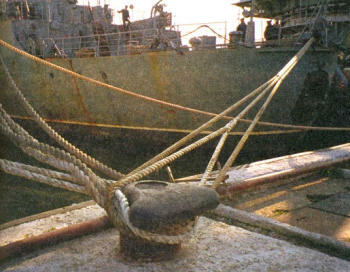 The Black Sea Fleet ships were slowly dying in repairs that dragged on for unthinkable periods of time. Instead of pavement there was a berth by the seafront. Rusty cigar of a midget submarine, its tail end hid from stranger's eye by a torn tarpaulin, towered directly opposite to the coffee tables. Barbecue grills with steaming shish kebabs stood here in close proximity to the landing aprons of the ships. And the sailors on watch, standing by the ladders, against all regulations flirted with the young women strolling about the embankments in white see-through dresses. The water here has always been and still is at the level of the embankment. In bad weather, the waves flow over right through the doors of the bar, forcing the visitors to lift their feet. It always seemed to me that the Balaklava Harbor was filled not with regular, but with holy sea water. No matter what kind of waste was dumped there, no matter what trash was sunk, it has always remained crystal-clear, so that the ships moored there were visible not just down to the bilge, but down to the anchors, grappling the bottom. Reflections of stucco facades of the former summer houses, the dark green cypresses, the pale steep slopes with rock slides, the crane arms and the black submarine cockpits quivered and rippled in its emerald mirror. The Russian Fleet has been led out of the Harbor, and the Ukrainian hasn't been brought in (not counting the small coast guard unit), but the water in the harbor is the same, and the seagulls are still white. The number of times I’ve been to Balaklava is the number of times I’ve seen the snakelike black bodies of submarines in its narrow three-bend harbor. They dozed off quietly in the greenish azure water, from time to time disappearing unnoticed and reappearing again in the same mysterious fashion, sometimes by the moorage walls, sometimes at mooring buoys. The western shore of the harbor, under the high and precipitous mountain, has always been the forbidden zone. One could access it only with special passes, passing numerous checkpoints, turnpikes, posts. But far from everyone who came there on duty had access to under the broad slate canopy, covered on the harbor side by spotted camouflage net, which hid the entrance into the most secret… And the steel net attached to the floating booms blocked the opening to the underground canal down to the very bottom, so that no sabotage frogman, no underwater demolitionist, could penetrate into the “Pipe.” The two projector rays coming from special platforms pierced the dark of the sea water at night. In May of 1994, the last Russian submarine was led out of Balaklava, accompanied by farewell honking. The city, and the port, and the subterranean harbor of submarines were fully transferred to under the Ukraine's jurisdiction. For some time, the top secret object of Crimea was under the defense of the National Guards. Later, the guard was removed and the massive antinuclear airtight doors opened, welcoming the ferrous and nonferrous metal scrap miners. First, all the cast iron lids covering the various communication wells, access hatches and shafts were stolen from the underground, turning the tunnels, galleries, and other passages of the Shelter into dangerous routes with treacherous “traps” for every careless step. More than once, carefree sightseers fell into these traps, filled with sea water and sharp protruding prongs. Three people died, and these are just the first, and, unfortunately, probably not the last, considering the present state of affairs for the victims of the “Black Hole.” It really is black, since the lighting grid in the workshops, storage facilities, and tunnels has long been pulled apart, the wires and cables, their copper veins torn out, stick out from the opened pathways, and the power generating machinery is disassembled. Another danger is the powerful mercury lamps that are broken everywhere, and the concentration of mercury vapors in some compartments exceeds life-threatening dozes. Broken glass crunches under one's feet. The light from the lamps jumps from one hole in the ground to the other. To avoid falling into open wells, we walk right in the center of the high-domed tunnel-highway between the narrow railroad rails. “We” are the President of the Sevastopol Naval Assembly, former officer submariner Vladimir Stefanovsky, design engineer Irina Karachintseva, and me. First, we entered the “Black Hole” driving our Volga through the main portal. Headlights cast light on the asphalt road, enclosed in a very long concrete pipe – the gallery. Had the railroad tracks been wider, a subway train could easily pass here. Huge crossroad halls emerged from the dark. Through their crossings, the rail cars once headed for the side tunnels and corridors. This was the real Zone – mysterious, gloomy, treacherous… The semi-fantastic plays of the “cold war” were acted out here. It’s easy to imagine a submarine, using its electric motors, quietly gliding underneath these arches under the light of the projectors, the caisson gate closing behind it and the powerful pumps pumping out the water, baring the ship down to its keel… Submarines were driven in here like missiles into a gun barrel, even if concrete, and then were silently “shot out” into the sea. Following the underground highway-gallery for about half a kilometer, Stefanovsky hit an open manhole with the left front wheel. We were stuck and had to get out of the car and continue on foot. We left the headlights on to be able to find the abandoned car in this labyrinth later on. My companions have visited here in better times, when the underground ship repair factory was flooded with bright light, and the work was in full swing all around: automobiles and mine cars bustled about, shipwrights made haste, hoister chains rattled, machine drills and cutters squealed… Irina Karachintseva has been here only once, when the power switchboards were being adjusted, but she was not allowed in farther than the underground power station. Stefanovsky, on the other hand, served in Balaklava for several years as chief engineer of the ship repair factory, and now peered bitterly at the mutilated walls and the remains of the garbled equipment. We enter the underground berth, whose cast iron dolphins were used by submarines for mooring. Water gleams dully in the canal under the high concrete arches. The main bend of the canal-tunnel goes off far into the depths of the mountain, to the place where the concrete hydraulic lock blocks the exit into the open sea. One can hear distant sound of the waves, like in a honeycomb pressed to one’s ear. And the light breeze is roaming through the gigantic pipe, from the inlet to the outlet. A rusty pontoon has been washed against the berth. We take the vertical ladder down to it, and, using our hands to push off the walls, slowly sail towards the exit. I direct the ray of light from my flashlight into the water. It’s very clear, but the bottom of the canal is not visible; the canal’s depth is around ten meters. But a school of quick gray mullet appears immediately. How strange it is to sail underground! Perhaps only the speleologists in cave lakes have a chance to observe such a play of the light, the dark, and the specks of light on the water. I have experienced something similar when I sailed on a raft down the Moscow’s river Neglinka, which is forced into pipes. But here the space is vast; it does not weigh upon you but only makes the adrenaline flow - what's next, behind that turn, in that arm of the river, behind that door, through those doorways? This gloomy and grand underground’s development began in the mid fifties, at the time when the US and the USSR began to unwind the rounds of the nuclear hysteria. A little before that, Stalin approved the comprehensive plan of defense from nuclear weapons of the principal industrial and defense objects of the country. The Soviet leader personally reviewed and endorsed the plan of the Balaklava underground submarine repair factory. It was, and still is, the world’s only underground submarine repair factory. They worked around the clock, like the miners, in four shifts. Step by step, cubic meter by cubic meter, day by day, year after year… The total output of the rocky ground exceeded 25 thousand cubic meters. Manmade clefts and caves appeared in the rock strata of the western cliff, turning into underground roads, sluice chambers, workshops, arsenals, storages, cabinets, mooring docks, and into a deep water canal and a dry dock that could be entered by a submarine. And, in general, in case of a nuclear threat, the underground harbor could serve as shelter for a whole brigade of submarines, and several thousand people as well. “Special reports on the progress of construction were delivered to Khrushchev,” tells Vladimir Stefanovsky. “And, of course, they were in a hurry to report to the Secretary-General the object’s completion ahead of schedule .” It was decided not to lengthen the dock in order to not extend the deadlines. That’s why the underground factory was able to accept only the middle-sized submarines, and when the large-sized ones began arriving at the Black Sea Fleet, the shelter started to lose its significance for defense. It was unreasonable to build such a colossus for just one project… They say that when Khrushchev inspected the construction, he waved it off, saying: “This should be handed over to the wine makers!" “And they would have handed it over!” continued Stefanovsky’s story the Vice-Mayor of Sevastopol, Valery Ivanov, when we met him after our last excursion. “A vigorous campaign “to beat swords into ploughshares” was taking place, the Armed Forces were being slashed, the Navy was being cut alive. But the fate of the Balaklava Shelter was defended by one Admiral Nikolai Gerasimovich Kuznetsov, who, despite being out of favor, flat-out bombarded the Central Committee of the Communist Party of the Soviet Union by his special reports and letters. Thanks to him, the underground factory was saved. It was built in five years, from 1957 to 1961, and it has been operated at full capacity for almost a third of a century, until 1993, when it was transferred to Ukraine. A faint light gleamed ahead. Then, the arch of the underground canal lit up with the bright oval of the exit into the sea. We moored to the massive ferroconcrete bridge, looking like it most likely collapsed, rather than lowered, into the water. Having ascended it, we saw a mass of jellyfish, swarming at the end of the canal. They were hiding from the approaching storm. This was symbolic in a way – the antinuclear shelter for submarines turned into a refuge for jellyfish. Yes, the creation of this masterpiece of naval fortification meant enormous human labor and many millions of those rubles that back then fully corresponded to dollars. Should the Shelter be exposed to further pillage and desolation or should an attempt be made to recover at least some of those resources that the “Black Hole” had swallowed? Today, this problem is being addressed by the fathers of the city, headed by Alexander Kuntsevich. The Sevastopol Naval Assembly offered the Balaklava Town Hall a project for creating a historical preservation zone called “The Underground of the Cold War" in the antinuclear shelter of submarines. It would contain theme exposition halls, installed in the former workshops and arsenals, a submarine, moored by the underground mooring dock, a tourist center, a cinema hall, showing the chronicles of the active military opposition of the two political systems, and, finally, an underground memorial for the submariners that died in the truly "cold" war, in which no shots were fired, in the depths of the ocean. Every local school boy knows that the name of their city in Turkic means a “fishing spot.” But where is the catch of the Balaklava fishermen, glorified by Kuprin – the gray mullet, the flatfish, the salmon, and the sturgeon? These days, their scows return from the sea carrying no more than some haddock. Balaklava is itself reminiscent of a soldier, who, having served faithfully and loyally for twenty five years, is now left with a ragged overcoat, broken rifle, and a hole-ridden drum. The bankrupt town lies still, awaiting the changes that are, as everyone here hopes, just around the corner.